Tofu can get such a bum rap. “Ewww, tofu!” – everyone’s heard it, and at one point or another, everyone’s probably thought it too. But tofu is what you make it, or, more accurately, how you make it. It’s such a versatile ingredient that there are myriad ways to cook and serve the stuff, which is probably why most of us have been experienced ill-prepared tofu. But there are plenty of ways to do it right! Baked, fried, or grilled. Marinated, crusted, or drenched in saucy goodness. Trust us when we say that tofu can be pretty much legendary. For real! For one, tofu takes on whatever flavors you throw at it, so when you marinate it, you’re on the right track. This recipe for Crispy Quinoa-Crusted Tofu, however, takes a different—but equally delicious—path. Because another sure-fire way to cook tasty tofu in your kitchen is to pan-fry it with a little cornstarch thrown into the mix. Cornstarch helps keep the moisture in and gives the outside a terrifically crispy exterior. For this recipe, we threw in a good amount of quinoa flour for a boost in protein along with s subtly nutty flavor. Good stuff. Our favorite way to eat this crispy tofu is straight-up, with a bold and spicy-sweet sauce for dipping. No “Ewww, tofu” here. Think tofu is tasteless? Think again! 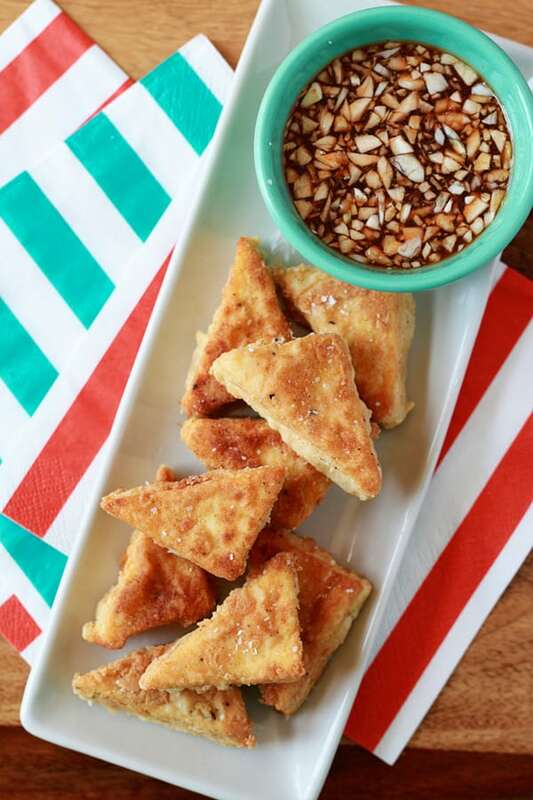 This crispy fried tofu – along with a transcendent dipping sauce – might just change your mind. Place a sturdy skillet (I like cast iron) over medium heat. Fill with oil to about 1/4 inch high. Cut the tofu into 16 triangles. To do so, first slice the tofu in half width-wise, then stack the squares back together and cut a + sign in the top for four equal squares. Then cut each square in half diagonally to make triangles. In a small bowl, whisk together the quinoa flour, cornstarch, 1/4 teaspoon salt and pepper. Pour the almond milk or soy milk into another bowl. When the oil is hot, it’s time to start cooking! Dip each tofu triangle in milk, then place it in the bowl with the flour, dredging so that it’s covered on every side with the flour mixture. Drop immediately into the skillet and repeat with the remaining pieces of tofu. Cook until golden brown on the bottom, about 2 minutes. Flip and cook on the other side until golden, about 2 minutes more. Transfer to a paper-towel lined plate to drain and cool. Sprinkle with a little additional salt if desired. While the tofu is cooling, make the dipping sauce. Serve tofu with dipping sauce alongside. I recently tried frying tofu coated in a bit of amaranth flour and it basically blew my mind. Now I’m on a mission to try it with all sorts of flours! Quinoa flour is definitely next. Am I sad….. I actually prefer my tofu without a marinade………… So this looks super-yummy-awesome-amazing!! !